It’s been miserably cold but somehow we are making progress. All the materials are sitting on the lake awaiting assembly. We are expecting warmer weather–in the mid 20s–for the next few days. The last component, and star of the show, the sauna will be built tonight. Wednesday will be a big lake day–getting the platform together and the tipi erection. But I fly back to New York today to install my exhibition “First Supper” that opens on Jan. 14. I won’t be on hand for all this excitement. I’ve passed the baton to my wonderful team. They have been incredible this past week working in the ice and snow and the colder than outside conditions in the Soap Factory. I haven’t known most of them very long but they are all the kinda guys who get things done while being good company too. Last night we had a meeting about the coming week and at the end we made a scale model of the tipi so we could talk through the process. 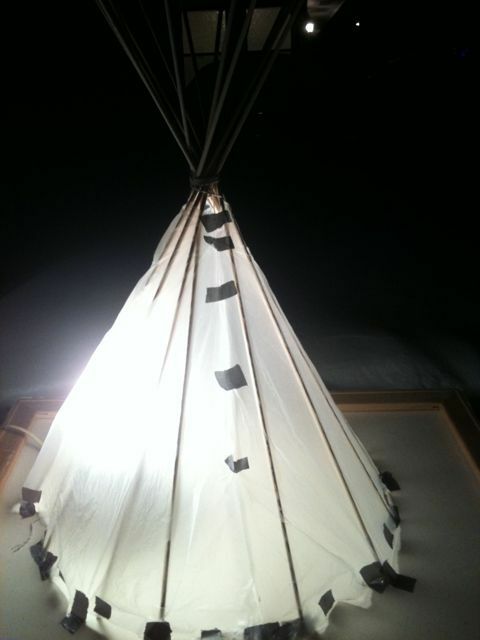 Here’s a picture of the practice tipi.